A 1962 Ferrari 400 Superamerica LWB Coupe Aerodinamico sold for $4,400,000 as the top result at the RM Sotheby’s Amelia Island 2016 classic car sale. Nine cars sold for more than a million dollar while a few others also attracted unsuccessful multimillion-dollar bids. RM Sotheby’s held its annual classic car auction in Amelia Island at the Ritz Carlton hotel in Florida, USA, on 12 March 2016. Just fewer than hundred cars were on offer. HB indicated highest bid not accepted. *Sold post-hammer. Prices include premium. RM Sotheby’s top result at the 2016 Amelia Island classic car auction was unexpectedly $4,400,000 for a 1962 Ferrari 400 Superamerica LWB Coupe Aerodinamico. The price was more than a million higher than the top pre-auction estimate while the three cars rated higher before the auction all failed to sell. This 1962 Ferrari 400 Superamerica LWB Coupe Aerodinamico was in single-family ownership for the first five decades and restored to concours condition in 2012. It is a matching numbers examples and one of only 18 built. 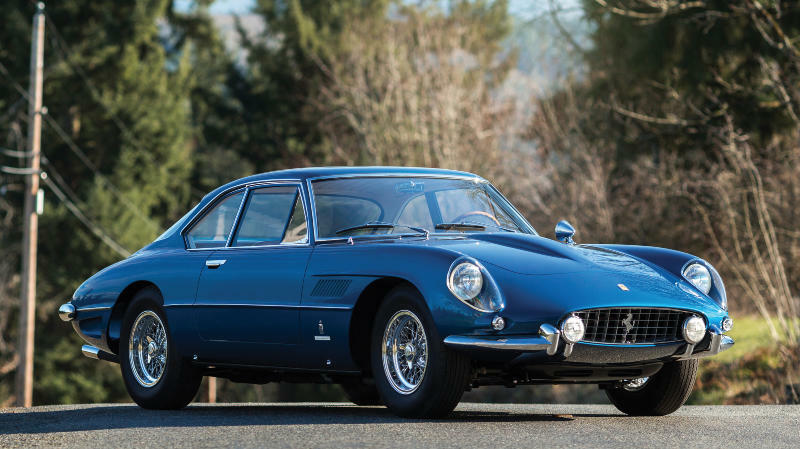 RM Sotheby’s sold another Ferrari 400 Superamerica in Paris 2016 for just below $3 million in a post-hammer deal. After two Ferrari 288 GTOs failed to reach reserve limits at the Scottsdale and Arizona auction earlier in the year, this 1984 Ferrari 288 GTO sold for $2,585,000 at the top of the pre-auction estimate. However, this was still $165,000 less than the same car sold for at the RM Auctions 2015 Arizona sale. This 288 GTO originally belonged to the renowned Japanese Ferrari collector Yoshino Matsuda. The recent good form for near-new supercars continued with a 2014 Pagani Huayra selling for $2,035,000 – around double the original price for a standard model. Only hundred were made and sold out in advance of production. This car has $260,000 worth of options fitted and came with a $20,000 seven-piece luggage set. It has covered only 400 miles since new. The 1968 Ferrari 330 GTS by Pininfarina (estimate $2.3 to $2.6 million) received a highest bid of $1.9 million and sold before the end of the auction for $2,000,000. This 330 GTS, is one of only 99 produced compared to nearly 600 of the 330 GTC coupe. The similarly priced 1973 Ferrari 365 GTS/4 Daytona Spider attracted a highest bid of $2.1 million but failed to sell. Like the 288 GTO, this Ferrari sold for more a year ago – $2.4 million at Gooding’s 2015 Scottsdale sale. The 1954 Bentley R-Type Continental Fastback Sport Saloon sold for $1,815,000 – more than $400,000 above the pre-auction estimate. This car had only four owners since new and won Best in Class at the Amelia Island Concourse in 2010. The other top Bentley on offer, a 1931 Bentley 8-Litre Tourer by Swallow, (estimate $1 to $1.25 million) failed to sell with a highest bid of $850,000 but sold post-hammer for only $2,000 more. The 1955 Mercedes Benz 300 SL Gullwing sold within estimate at $1,265,000. However, the cheaper 1957 Mercedes Benz 300 SL Roadster failed to sell with a highest bid of $950,000. Bonhams sold a Gullwing for only $902,000 two days earlier. The days if turning up to sell any 300 SL seem to be over for the moment. The 1932 Packard Twin Six Coupe Roadster sold for $1,210,000 – way over the estimate $650,000 to $800,000. The 1963 Shelby 289 Cobra sold near top estimate for $1,155,000. The 1968 Chevrolet Sunoco Camaro Trans Am sold just shy of a million dollar at $990,000. Some of the top cars failed to sell during the RM Sotheby’s Amelia Island 2016 classic car auction, although post-hammer deals were possible. 1957 Ferrari 250 GT Berlinetta ‘Tour de France’ – this dual-use Ferrari received the highest bid of the auction – $4,250,000 million. 1939 Mercedes Benz 540 K Spezial Cabriolet A by Sindelfingen – the highest bid was $2,8 million – just $200,000 below the lower estimate. Bonhams sold a Cabriolet A for similar money two days before and will have five 1930s Mercedes Benz 500 / 540 K cabriolet on offer later in March at the 2016 Mercedes Benz Museum sale. 1911 Rolls Royce 40/50 HP Silver Ghost Tourer by Lawton received a highest bid of $2.1 million – the estimate was $2.5 to $3 million. Of the five Rolls Royce cars expected to sell for a million or more this year, none have sold.